Question: I’m calling about Kamehameha Highway, which is already affected by the rail construction. When are they going to pave from Waimano Home Road up to Waimalu and Pearlridge? They are talking about the roads into town when they haven’t even wrapped up our end yet. Answer: The Kamehameha Highway resurfacing project will occur in two phases. Phase 1 is the section between Kuala Street and Kuleana Road, basically Pearl Highlands to the Hawaiian Electric Co. Waiau power plant, said Bill Brennan, a spokesman for the Honolulu Authority for Rapid Transportation. “Residents who’ve been awaiting the work should see shovels in the ground” by early October, he said, noting that Road and Highway Builders, LLC (RHB) was awarded the contract in mid-July and the notice to proceed was issued in mid-August. Since then, RHB has been acquiring required permits, mobilizing equipment and otherwise preparing for the work that will be visible to motorists shortly, he said. RHB plans to use multiple crews on an accelerated six-day, Sunday-to-Friday schedule to complete Phase 1, which will last through the end of the year, Brennan said. Phase 2, from near the Waiau power plant toward Aloha Stadium, is scheduled to begin early next year, with completion in fall 2019, he said. The project will include pavement resurfacing, including full-depth reconstruction, cold planing and paving and installation of pavement markings and striping, roadway signs, curb ramps, drainage, traffic signal loop detectors, retaining walls, fencing and bus shelters, he said. In your question, you referred to news that roads in the urban core will soon be affected, as utilities are relocated to make way for rail construction (808ne.ws/91918). Relocation of sewer lines, water lines and electrical lines is among the rail project’s most disruptive work, Brennan has said. 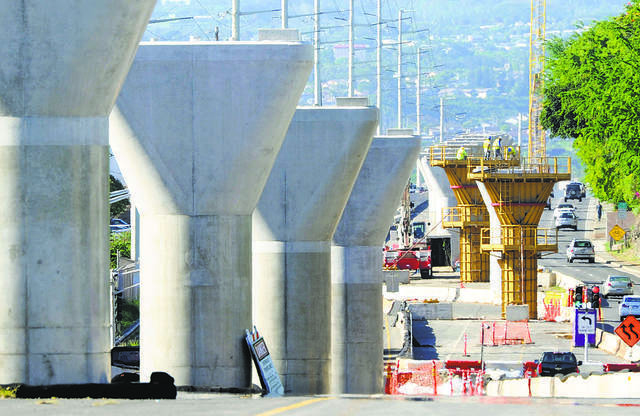 Wisdom gained during construction of the Waipahu and Pearl City-Aiea rail transit segments will be applied in hopes of improving the experience for residents and businesses as construction proceeds into town. Q: I live near Ala Wai Park, which is heavily used during all hours of the day and well into the night by baseball, softball, soccer, walkers and joggers. The park recently has been invaded by a large homeless population, along with their many unleashed animals. There are tents fronting Kapiolani Boulevard, blocking sidewalks and frightening seniors who attend the park’s recreational activities during the week. Clusters of aimless young teens linger in the park during school hours and into the evening. They leave a trail of rubbish as they move from spot to spot. As the sun sets, many adults and teens camp on old mattresses among the overgrown trees leading into the canal. What is being done to make the park safe again for the general public? A: “The Department of Facility Maintenance Stored Property/Sidewalk Nuisance Enforcement Team (DFM SPO/SNO) conducted nine separate enforcement actions at Ala Wai Community Park from Aug. 1 to Sept. 21. The enforcement actions are complaint based, so we ask for the community’s support by calling 768-4381 to report illegally stored personal property within any city facility, park or sidewalk. Since the Department of Facility Maintenance considers this inquiry to Kokua Line as a complaint, we will be following up with another enforcement action soon. Violations of posted city park prohibitions (including use during posted hours of closure) should be reported to police by calling 911,” Ross Sasamura, director of the city’s Department of Facility Maintenance, replied in an email Friday. Write to “Kokua Line” at Honolulu Star-Advertiser, 7 Waterfront Plaza, Suite 210, 500 Ala Moana Blvd., Honolulu 96813; call 529-4773; fax 529-4750; or email kokualine@staradvertiser.com.